Mass Pike (I-90) into New York State. Continue on I-90 (using exit B1) to exit 9, to Route 4 north. On Route 4, travel 3.5 miles to a right onto County Route 74 (Winter St. Ext.). Travel approx. 2 miles. When the road forks, bear left (leaving Route 74 and continuing on Winter St. Ext.) to end. Turn left onto Pawling Avenue (Route 66). Emma Willard is .8 miles ahead on the right, marked by a wrought-iron fence. Exit 23 off New York State Thruway, to I-787 northbound, to Route 7 east. Now see below "From All Points." New York State Thruway to Exit 24. Continue on I-90 to I-787 northbound, to Route 7 east. Now see below "From All Points." Northway I-87 south to Exit 7, Route 7 east to Troy. Now see below "From All Points." 42° 42' 45.197748", -73° 39' 57.903444"
*Corporate rates may be available. 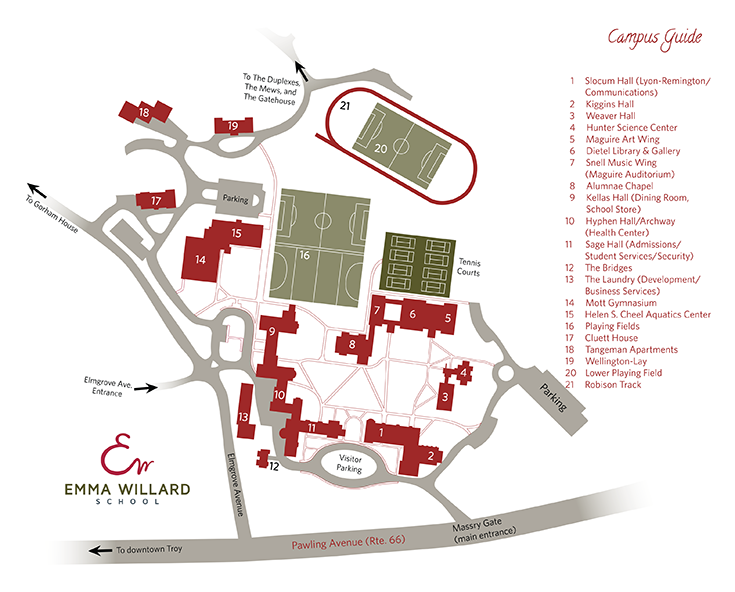 Please mention Emma Willard School when making your reservation. From the Collar City Bridge heading east, follow Route 7 east (Hoosick St.) to fourth traffic light. Turn right onto 15th Street and follow it to the end past Rensselaer Polytechnic Institute (approx. one mile). Turn left onto Route 2, then bear right onto Route 66 (Pawling Ave.) at the second traffic light. Emma Willard will be on your left (one mile) after the fourth traffic light at Maple Ave., marked by a wrought-iron fence. Continue along the front of campus past the fifth light (at Myrtle Ave.) to Massry Gate, the main campus entrance on Pawling Avenue, on your left. Upon entering Massry Gate, bear right for visitor parking.